Bruce Greenwald is one of the leading authorities on value investing. Some of the savviest people on Wall Street have taken his Columbia Business School executive education course on the subject. Now this dynamic and popular teacher, with some colleagues, reveals the fundamental principles of value investing, the one investment technique that has proven itself consistently over time. After covering general techniques of value investing, the book proceeds to illustrate their applications through profiles of Warren Buffett, Michael Price, Mario Gabellio, and other successful value investors. A number of case studies highlight the techniques in practice. Bruce C. N. Greenwald (New York, NY) is the Robert Heilbrunn Professor of Finance and Asset Management at Columbia University. Judd Kahn, PhD (New York, NY), is a member of Morningside Value Investors. Paul D. Sonkin (New York, NY) is the investment manager of the Hummingbird Value Fund. Michael van Biema (New York, NY) is an Assistant Professor at the Graduate School of Business, Columbia University. Preface to the Paperback Edition. PART I: AN INTRODUCTION TO VALUE INVESTING. 1. Value Investing: Definitions, Distinctions, Results, Risks, Principles. 2. Searching for Value: Fish Where the Fish Are. PART 11: THREE SOURCES OF VALUE. 3. Valuation in Principle, Valuation in Practice. 4. Valuing the Assets: From Book Value to Replacement Costs. 5. Earning Power Value: Assets Plus Franchise. 6. A Wonderful Little Franchise: The Earning Power of WD-40. 7. Inside Intel: The Value of Growth Within the Franchise. 8. Constructing the Portfolio: Risk, Diversification, and Default Strategies. PART III: VALUE INVESTING IN PRACTICE: PROFILES OF EIGHT VALUE INVESTORS. 9. Warren Buffett: Investing Is Allocating Capital. 10. Mario Gabelli: Discovering and Unlocking the Private Market Value. 11. Glenn Greenberg: Investigate, Concentrate, and--Watch That Basket. 12. Robert H. Heilbrunn: Investing in Investors. 13. Seth Klarman: Distressed Sellers, Absent Buyers. 14. Michael Price: Discipline, Patience, Focus, and Power. 15. Walter and Edwin Schloss: Keep It Simple, and Cheap. 16. Paul D. Sonkin: Small Is Beautiful, Especially When It's Ugly. BRUCE C. N. GREENWALD is the Robert Heilbrunn Professor of Finance and Asset Management at Columbia University Graduate School of Business. JUDD KAHN has taught history, served in city government, and worked as a securities analyst, a CFO, and a management consultant. He has a PhD in history from the University of California, Berkeley. PAUL D. SONKIN is the investment manager of the Hummingbird Value Fund. He has worked at the SEC, Goldman Sachs, Royce Funds, and First Manhattan Company. He holds an MBA from Columbia. MICHAEL van BIEMA is a member of the finance faculty of Columbia Business School. Prior to joining the faculty of Columbia, he was a principal at the RONIN Corporation, a management consulting firm, and the cofounder of several technology companies. He has a PhD from Columbia in computer science. 1. BRUCE GREENWALD is one of the leading authorities on value investing and some of the savviest people on Wall Street take his Columbia Business School course in value investing. He is a dynamic and popular teacher among professionals and graduate students. 2. 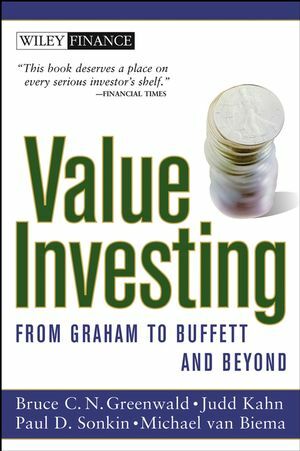 DEMONSTRATES THE FUNDAMENTAL TECHNIQUE OF VALUE INVESTING AS PRACTICED BY THE GREATEST VALUE INVESTORS. Profiles include Warren Buffet, Michael Price, Mario Gabelli, and Walter Schloss, among others.